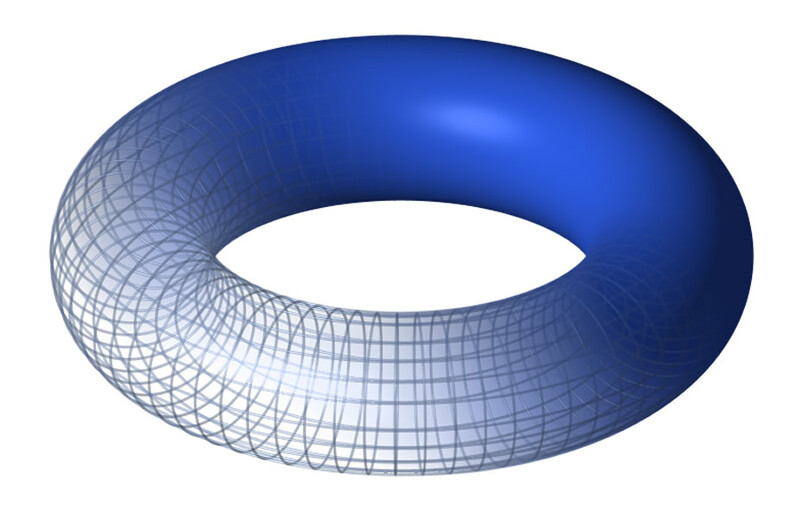 The word [torus] is of Latin origin and refers to “a rounded protuberance or swelling”. In science, it refers to a doughnut-shaped structure (see image). It also refers to the rounded, bulging, and circular base component of a pillar, found between the square plinth and the main body of the pillar. The torus can be seen in Egyptian, Greek, and Roman style pillars. The term is used in anatomy and medicine to denote normal or abnormal circular or semicircular protuberances, as in the case of the “torus tubarius”, a normal semicircular elevation found at the ostium of the auditory tube (of Eustachius) in the lateral walls of the rhinopharynx. The torus tubarius elevation is due to the presence of lymphoid tissue which can get inflamed. In orthopedics it is used to denote a compression fracture where the cortex of a long bone close to one of its epiphyses buckles under longitudinal (axial) compression. The look of the fracture is similar to the location of the torus in a pillar. 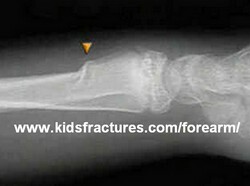 An example of this is the torus fracture (also known as buckle fractures) in children. The term [torulus] is related to [torus], as it means a “small torus” and it refers to a small elevation, which is synonymous with the word “papilla”. An example of this is the term torulus tactiles palmaris, referring to small elevations on the palms of the hand. Another related term is [torulosis], referring to a large number of small elevations or pimples. 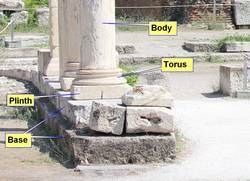 The following images are of a Greek pillar taken in 2014 in Athens showing the location of the torus. The next image shows a torus fracture. The image is from www.kidsfractures.com/forearm/ and we thank them for sharing the image with us. This is a great site for information on fractures in children. The normal components of the aortic valve are part of the aortic root. The valve is composed of three leaflets, each of which are related to a sinus of Valsalva, and three interleaflet triangles. The anatomy of the aortic root, the aortic valve and the interleaflet triangles of the aortic root have been described in other articles in this website. A bicuspid aortic valve (BAV) is probably the most common cardiac defect of congenital origin. The prevalence of BAV ranges from 0.9% to 2% in the general population with a 3:1 male-female ratio. In spite of the anomaly, a BAV may achieve normal valvular function, but this probably does not last, as BAV tend to develop calcifications in the adult leading to valvular disease, dysfunction, valvar stenosis, so complications are common, the most common being dilation of the aortic root and ascending aorta. The etiology of a BAV is commonly accepted as congenital and there are some studies that demonstrate a familial component, but it can appear in families where there is no known history of BAV. There are several attempts at classifying BAV, as the leaflets that fuse are different, and so is the way of fusion. There is one rare BAV called “pure”. This purely BAV is a true BAV, composed of two leaflets of similar size where there is no clear fusion line or “raphe” between the fused leaflets (see image). This valve has two well developed interleaflet triangles and the third can be absent or vestigial. The image depicts the excised calcified leaflets where the left and right coronary cusps are fused. Other types of BAV have a well-developed raphe, have two well developed interleaflet triangles and the third may be large or anomalous. The leaflets may also be asymmetrical. The classification of the different types of BAV goes beyond the objective of this article, but they can be studied in the references at the end of this article. There is no doubt that the different types of BAV can cause valvar disease and hemodynamic chaos, so the surgical approach for these may be different, including valve repair, aortic annuloplasty, interleaflet triangle remodeling, and of course valve removal and prosthetic implant, either biological or mechanical. Clinically, the pathologies related to the function of the aortic valve are stenosis, valvular incompetence, and in some cases intimal aortic dissection, which is a catastrophic complication. Some of these complications are triggered by the calcification of the bicuspid leaflets. Interestingly, although BAV is a congenital disease, only one in fifty children known to have BAV have clinically significant disease by adolescence. PERSONAL NOTE: I have permission to publish the image in this article… because the bicuspid aortic valve depicted in this article is my own. My personal thanks to the medical and support personnel at the Memorial Hermann Heart & Vascular Institute, in Houston, TX., and my three cardiovascular physicians without whom I would not be back writing this article, Drs. Randall K. Wolf (contributor to this website), Dr. William Ross Brown (cardiologist), and Dr. Tuyen Nguyen, who operated on me. 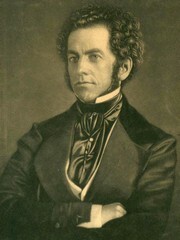 Dr. Miranda. 1. “Etiology of bicuspid aortic valve disease: Focus on hemodynamics: Atkins, SA, Sucosky, P World J Cardiol. 2014 Dec 26; 6(12): 1227–1233. This is the most popular article on this blog by far! The ligament of Treitz is formed by a fold of peritoneum over the suspensory muscle of the duodenum. This muscle is also known as the "muscle of Treitz" or "musculus suspensorius duodenii". This muscle was first described in 1853 by Dr. Václav Treitz. The muscle (see image #1) has an unusual structure in that it is formed by a tendon with two muscular ends of dissimilar embryological origin and function. The superior muscular component is skeletal (voluntary) muscle and arises as a slip of muscle (Hilfsmuskel) from the right esophageal crus of the respiratory diaphragm, as well as muscular and ligamentous fibers arising in the region of origin of the celiac trunk and superior mesenteric artery. The inferior portion of the muscle is smooth (involuntary) muscle and has been described as continuous with both the longitudinal and circular muscle layer of the intestine at the duodenojejunal junction. 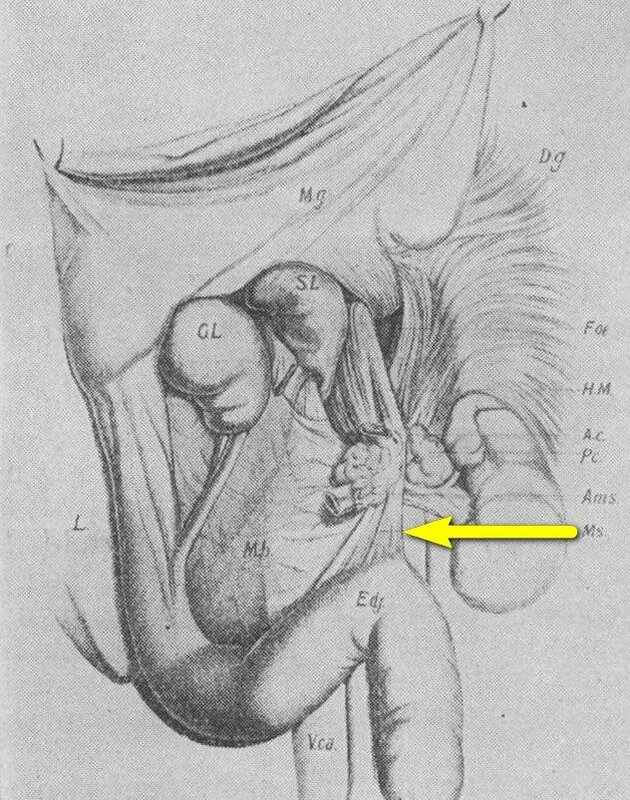 The ligament of Treitz is an anatomical landmark used by anatomists and surgeons to denote the duodenojejunal junction and the point where the small intestine passes from retroperitoneal duodenum to intraperitoneal jeunum. Surgeons use the ligament of Treitz to measure the jejunum to decide where to perform an anastomosis.Click on the gray bar below the image to see the original sketch published by Dr. Václav Treitz in his 1853 publication "Ueber einen neuen Muskel am Duodenum des Menschens" (On a new muscle in the duodenum of man). The 'muscle of Treitz" is marked by an arrow. It is important to clarify that the term "ligament" in the abdominopelvic cavity has a different meaning and structure from a skeletal ligament found in a joint. For more information click here. Clinical anatomy, pathology, and surgery of the gastrointestinal tract are some of the many lecture topics developed and delivered to the medical devices industry by Clinical Anatomy Associates, Inc. 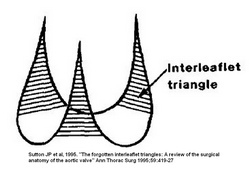 The interleaflet triangles (ILTs) are three triangular regions found in the ventricular aspect of the aortic root. They are bound inferiorly by the virtual basal ring (VBR), laterally by the attachment of the leaflets (the hinge) to the aorta and left ventricular wall (muscular and fibrous), and superiorly by the commissures (site of attachment and meeting of adjacent leaflets) which are usually located at the sinotubular junction, also known as the sinotubular ridge. A review of the literature on the topic shows that although many speak of these ILTs, not many authors have clearly defined their boundaries. In fact, some only reserve the term ILT to the triangular region distal to the ventriculoaortic boundary. The description used in this article includes the ventricular wall found between the VBR and the ventriculoaortic junction as well as fibrous components found between these two boundaries. Based on this description, we have developed an image of the ILTs that, to our knowledge is not found in literature. (see accompanying images). Interleaflet triangles of the aortic valve by MTD. The superior boundary of the ILTs is formed by three commissures, the points where the leaflets meet each other at the sinotubular junction. There are two posterior commissures, right and left. The right-posterior commissure is found between the noncoronary and the left coronary sinuses (of Valsalva). An important point about this commissure is that it is situated above the midpoint of the septal (anterior) leaflet of the mitral valve. The left-posterior commissure is found between the left and the right coronary sinuses. The anterior commissure is located between the right and the noncoronary sinus close to the membranous interventricular septum. a. Right (posterior), left (posterior), and anterior. The right posterior ILT is located between the noncoronary and the left coronary sinuses, and just as the commissure at its apex, is located at the midpoint of the septal (anterior) leaflet of the mitral valve. Also, the superior aspect of this ILT is related to the transverse pericardial sinus. b. The left posterior ILT is located between the right and the left coronary sinuses, and is lies immediately behind the right ventricular outlet. c. The anterior ILT is found between the right and the noncoronary sinuses. It is related to the membranous septum and the right fibrous trigone, forming part of the central fibrous body (skeleton) of the heart. This ILT is a good anatomical landmark to the location of the bundle of His and the left bundle branch, both components of the conduction system of the heart. These structures can be compressed during the implantation of an aortic or mitral valve, causing transitory or permanent cardiac conduction problems. The ILTs are important in the normal physiology and hemodynamics of the aortic valve. A small ILT will affect the diameter of the valve and the movement of the leaflets, causing stenosis. 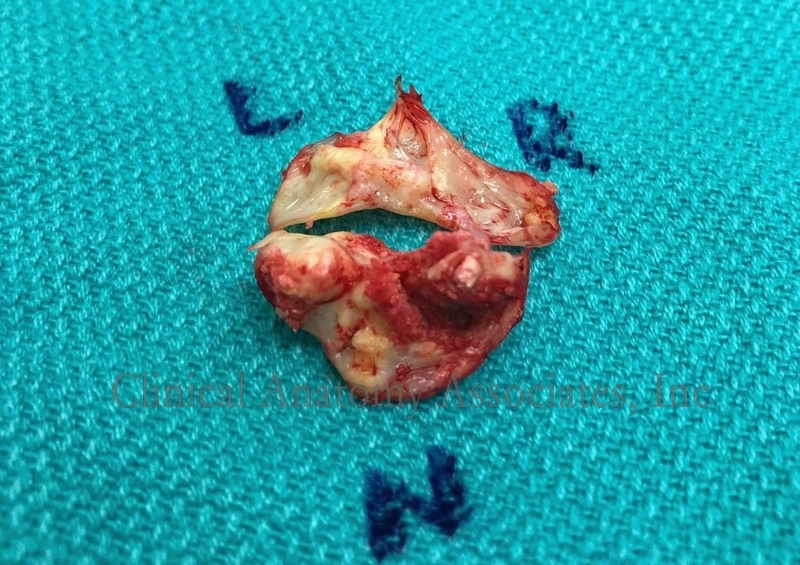 This is the case in bicuspid aortic valves where the fusion of two of the leaflets leads to the reduction in size of the ILT normally found between these two fused leaflets. Since they are located within the functional portion of the left ventricle, the ILTs are subject to the pressures of the ventricle and can be areas that develop aneurysms. Because of their importance in the hemodynamics of the aortic valve, new procedures and medical devices that reshape the ILTs are being developed. 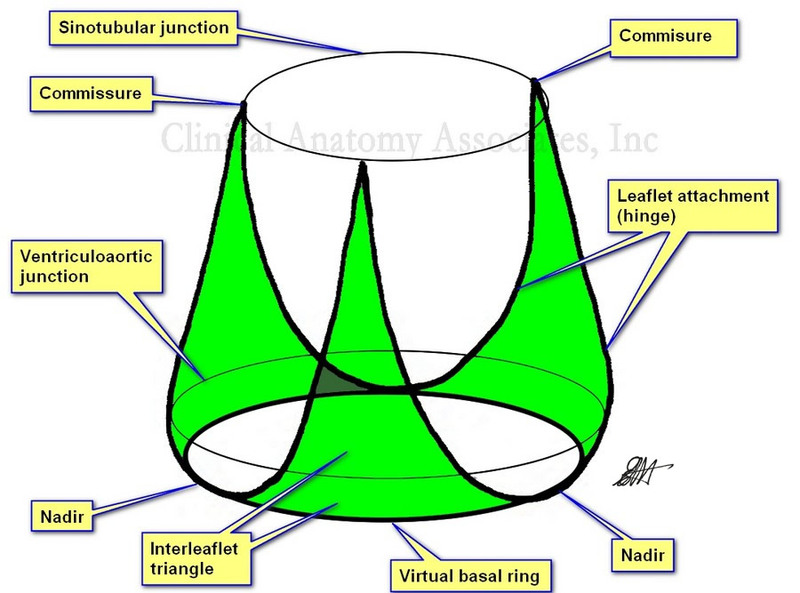 This is specially important in the case of a bicuspid aortic valve, where the interleaflet triangles may be abnormal. 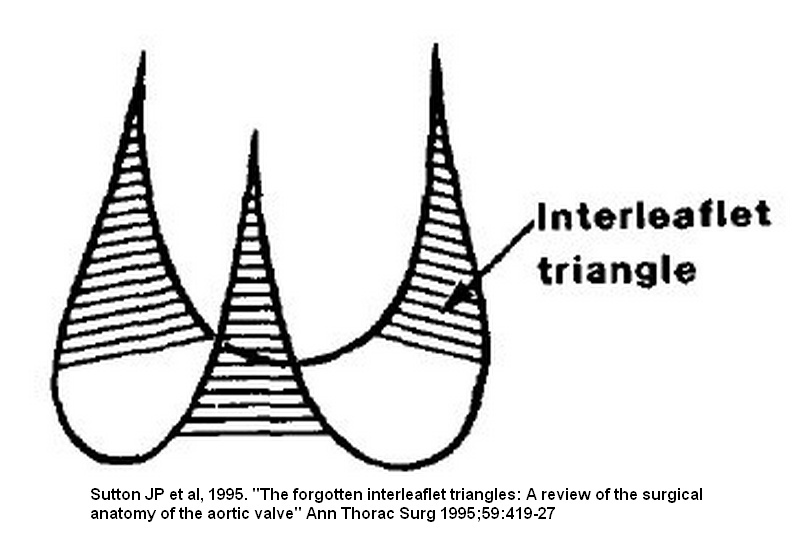 Interleaflet triangles of the aortic valve by Sutton. Further to the images that are depicted in this article, the lower image is the classic image of the interleaflet triangles by Sutton (1995). As you can see, the base of the triangles is shown straight with no clear boundary, and it seems as though they are related to the ventriculoaortic junction. The nadirs are not used as a point of reference. The upper image (developed by us and based on Sutton's original sketch) clearly shows the extent of the ILTs as well as their relation to the three landmarks that define the aortic root: The virtual basal ring, the ventriculoaortic junction, and the sinotubular junction. NOTE: The pulmonary valve also has interleaflet triangles, with a somewhat similar description, but since they are under low pressure they do not develop or are cause of pathology as the ILTs of the aortic valve. Each of the three aortic leaflets has a semilunar attachment and shape (hence the term “semilunar valve” used for both the aortic and pulmonary valve, as they have similar shape). The attachment of these three leaflets create a continuous line where the highest points are the three locations where the leaflets attach at the STJ, and the three lower points or “nadirs” form an edge shaped like a three-pronged “coronet”. This coronet is called by many the “anatomical anulus” of the aortic valve, as this is where the fibrous skeleton of the heart forms the “hinges” of the aortic valve. Aortic root and aortic valve. The leaflets of the aortic valve (as well as those in the pulmonary valve) have a tissue excrescence that can become quite hard at the point where the three leaflets touch on each heartbeat. These are the nodules of Arantius, named after Giulio Cesare Aranzio (1530 – 1589). As a side note, the nodules of the pulmonary valve have a different name. Distally, the aortic leaflets may present a very thin extension that may be cribriform (not shown in the sketch). These are called the lunulae (singular: lunula) as they look like a sliver of moon. The second component of the base of the aortic root is a ring defined by the lowest portion of each leaflet, the nadir. This ring is called the “virtual basal ring”, is found within the left ventricle and is used as a surgical reference for aortic valve replacement implants. The three leaflets are found within three dilations of the aortic root, each one called a “sinus of Valsalva”, which extend between the virtual basal ring inferiorly and the STJ superiorly. The presence of the sinuses of Valsalva permits “fluttering” of the open aortic leaflets in ventricular systole. This fluttering of the leaflets allows blood to flow into the sinuses and into the coronary arteries during ventricular systole. Aortic valve may present with different number of leaflets, as in the case of a bicuspid aortic valve. First, there is a portion of the ventricle related to the leaflets where the ventricle acts as an artery, the aorta. 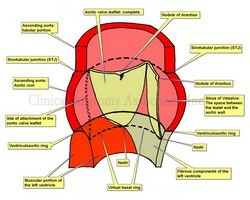 These areas are found inside the sinuses of Valsalva. Second, there are triangular areas of the aortic root (the interleaflet triangles) where the aortic wall is within the left ventricle and submitted to the pressures and hemodynamics of the left ventricle. 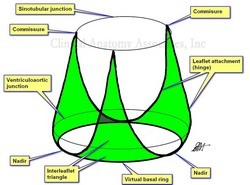 These interleaflet triangles have been involved in aneurysms. For simplicity, these interleaflet triangles are not shown in the sketch and are the subject of a separate article in this website. Note: The image depicts only one complete aortic leaflet. 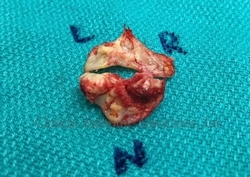 The other one has been transected to show the sinus of Valsalva and the third has been removed to show the attachment or "hinge" of the leaflet. For an anatomical image of the aortic valve click here. The term “aortic valve” refers to the three leaflets (or cusps) components that allow passage of blood from the left ventricle to the ascending aorta during ventricular systole, while at the same time preventing regurgitation or reflux of blood back into the ventricle during ventricular diastole. 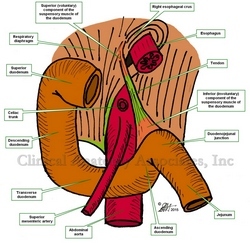 In reality, the “valve” is only a component of a larger structure called the “aortic root”. 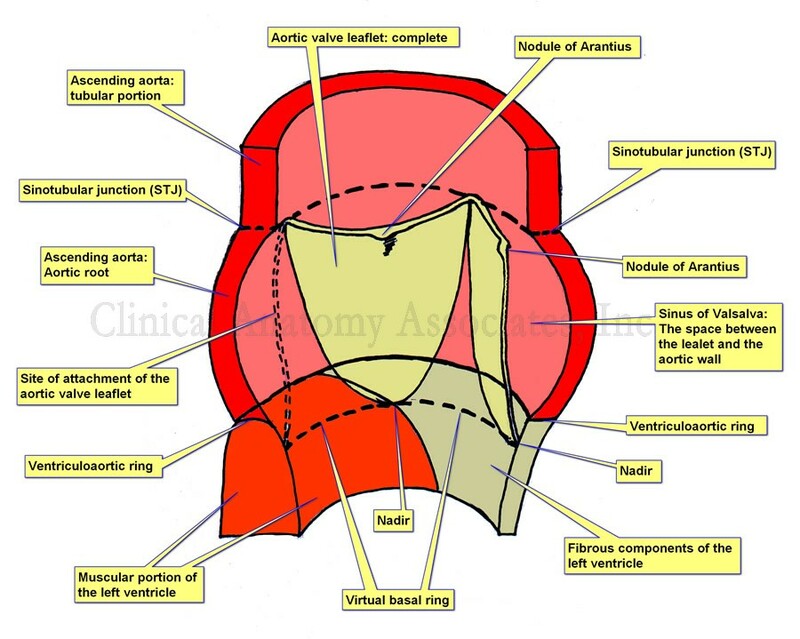 This article will describe the components of the aortic root and the aortic valve. The ascending aorta presents with two distinct segments. 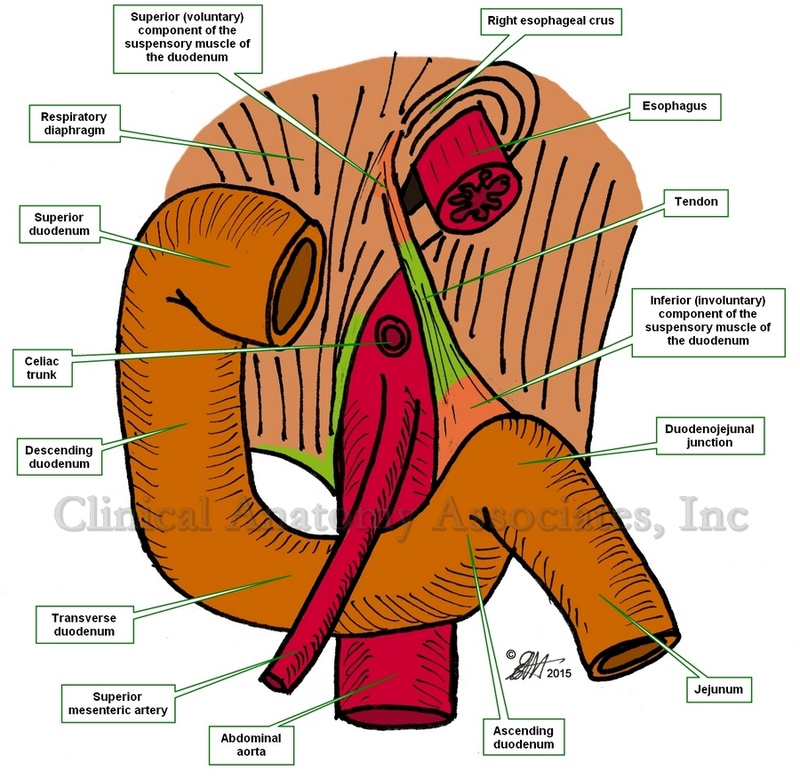 The proximal segment is a dilated portion called the aortic root. The distal portion is known as the tubular portion of the ascending aorta. The boundary between these two portions is the [sinotubular junction (STJ). Some authors will recognize as the ascending aorta only the tubular portion. The aortic root is that portion of the ventricular outflow tract and proximal aorta that supports the leaflets of the aortic valve. It is a functioning unit with relations both to the to the aorta and to the left ventricle, and it is here where in most cases we find the ostia of the right and left coronary arteries. The aortic root is composed of the three dilated sinuses of Valsalva, two of which give origin to the coronary arteries (right and left), three leaflets (or cusps), and the interleaflet triangles. While the distal boundary of the aortic root is clearly defined (the STJ), the proximal boundary is not as clear and is difficult to define. The STJ is defined by the apices of the three aortic leaflets as well as a clear line that appears as the aorta passes from the dilations of the sinuses of Valsalva to the well-defined tubular portion of the ascending aorta. This proximal boundary is defined clinically by two circular regions: the ventriculoaortic ring distally and the virtual basal ring proximally. The ventriculoaortic ring is a circular region formed by the left ventriculoaortic junction (the point where the aorta anchors on the left ventricle), and fibrous tissue of both the “cardiac skeleton” and the membranous interventricular septum. It is also called the “surgical anulus”. This is the area where a surgeon will anchor an aortic replacement valve.